SQT Training Ltd. is committed to implementing equal opportunities in all aspects of its business for staff and students. Equality of opportunity is the right of all persons to receive fair, equal, and non-discriminatory consideration in access to and the processes of education and employment, irrespective of characteristics including, but not limited to, gender, marital status, family status, sexual orientation, religion, age, disability, race or membership of the Traveller community. The organisation is committed to promoting equal opportunities in education and employment in recognition of the principles of equity and social justice and in conformity with equality and anti-discrimination legislation. The organisation accepts its responsibility in relation to these rights for people while they are engaged in activities undertaken as part of their study or their employment with the company. SQT recognises the rights of individuals and groups to be free from discrimination and harassment on the grounds of gender, marital status, family status, sexual orientation, religion, age, disability, race or membership of the Traveller community as set out in the Employment Equality Act 1998. 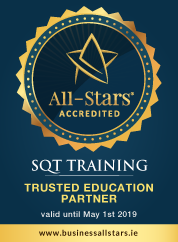 SQT affirms the right of all staff and students to work in an environment free from harassment on grounds of gender, marital status, family status, sexual orientation, age disability, religion, race and membership of the traveller community Behaviour of this kind may lead to disciplinary action and other sanctions at the discretion of the company.